Comprehensive business intelligence and corporate performance suite that allows better and faster decision making for everything from strategy, forecast, budgets, reports and analysis. BI360 Business Intelligence Tool provide a complete analytical and reporting tool with a complete Excel and web-based suite comprising of Reporting, Budgeting, Dashboards and Data Warehouse for organisations to use seamlessly with business management solutions. Solver BI360 suite has the capabilities to streamline all the reporting processes, making it more cost effective. 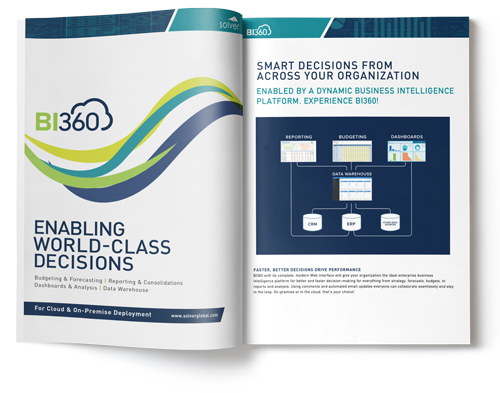 Switching from older reporting and analytical tool to BI360 will result in lower maintenance, lower ongoing training and support and less dependencies on the IT team to churn our reports. BI360 comes with out of the box integration capabilities with EPR solutions allowing you to build and run reports with ease from popular ERP solutions such as SAP Business One and Microsoft Dynamics 365. Personalised dashboards with real time live data for your team and managers to enable better decision making based on analysis and data from your ERP solutions. BI360’s budgeting module provides your organisation with flexible budgeting, forecasting and modeling possibilities. This saves you time from tedious and long implementation from typical ERP reporting solutions. Solver BI360 is a popular business intelligence tool which automates the collection and analysis of data. The business intelligence tool provide a complete Excel and web-based suite comprised of Reporting and Budgeting, Dashboards and Data Warehouse to enable organisations to use the tool seamlessly with their business management solutions. Comprehensive business intelligence suite designed to propel business performance, efficiency and productivity throughout your enterprise. Packed with capabilities and functionalities that allows analysis of information from multiple data sources. Seamlessly integrates with third party systems including SAP Business One and Microsoft Dynamics 365.